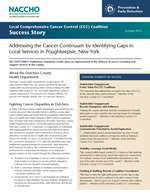 This is a local comprehensive cancer control (CCC) coalition success story on Dutchess County Health Department and its efforts with addressing the cancer continuum by identifying gaps in local services. In order to download a PDF, you will need to register for a free account in order to obtain a log-in. You’ll then log in, add the PDF to your shopping cart, and complete the ordering process. You will not be charged any fee for PDFs with a listed price of $0. After you have placed your order for the PDF, you will be able to access it in your “My Transactions” and download it as many times as you’d like over a period of seven days.